The rain season has started. It rained all day last Saturday and Sunday evening. Last night, Chef Pauly invited me to go hunt for some wild mushrooms. He has gone out during the weekend and already picked a bunch. This morning I picked him up and drove to one of our regular spots. Shortly after we got on the trail, Chef spotted a few white puffballs. I was very excited because I had never found puffballs before. Even though Chef saw them first, at least now I know what to look for. We passed by our regular candy caps spots, but they weren't out yet. It usually takes about a full week of soaking rain for the candy caps to come out. We continued on and went off the trail to look for golden chanterelle. We started going down some pretty steep hill. Chef started to see the chanterelle. I was still trying to adjust my eyes and mind to see what I needed to see. It didn't take long for me to started seeing them, too. As usually, I screamed with joy then reminded myself not to be so loud. Both of us started picking and filling our bags. It was quite a work out as we worked out way down and up the steep hills, but I felt refreshed as we got back on the trail finally with out bags of mushrooms. Cleaning chanterelle is a lot of work as they are covered in dirt. I trimmed off the dirtiest parts and cleaned each one carefully. It is perfectly okay to ingest some dirt, but I just prefer not to have dirt in my food if all possible. I cooked some of the chanterelle tonight for dinner. I dry sauteed the chanterelle expecting a lot of liquid coming out of them. To my surprise, only a little liquid came out and it was soon evaporated. I didn't have to transfer the mushroom liquid into a bowl. I think that's because these chanterelle were picked so early in the season, and they have not overgrown and pack up much liquid. Unlike the ones I picked in previous years, these chanterelle felt firm instead of plump. Even though these chanterelle are not as big as some others I have picked, I like the firm texture a lot better. I can't wait to eat the rest of them and pick some more soon. A friend of mine came by the other day to visit. As we sipped on our coffee talking about the upcoming holidays, she asked me how my lilikoi was doing. She lived in Hawaii for many years before moving to El Cerrito, so we both love and miss tropical fruits. I told her that I have quite a few fruits but they didn't seem to be ready yet. My passion vines started to bloom in June, and I discovered the fruits in early July. It is now November. I started to wonder whether they would ever be ripe. We stepped out to the farm, and I lifted up the green bean vines over the passion fruit vines to show her the hanging fruits. One of the dark purple ones fell on the ground as I was pulling the vines. Since it was dark purple, perhaps it was ready although I thought it had to be wrinkly. I picked it up, and we went inside to cut it open. As I cut the smooth hard purple shell open, we immediately smelled the distinctive fragrance of passion fruit. Both of us cheered in excitement and took our cameras out to record this historical moment. 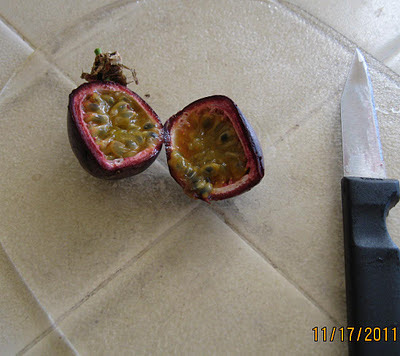 We were both amazed that we could a fresh passion fruit right here in El Cerrito in the middle of November. It took me two years to grow the cuttings indoors until they established roots. I planted them outside in November 2010. A year later, I have fruits. If it survives the winter, I am sure I'll have a lot more fruits next summer. My friend looked at the passion fruit with envy. I handed her a spoon and half of the fruit. "Let's try it!" I said. It was sweet, and both of us savored it with fond memories. Passion fruit always reminds me of sharing them with my grandfather when I was a kid back in Taiwan. My memory of passion fruit was bigger. I am not sure whether they were bigger in the subtropical climate or perhaps everything looked bigger to a 5-year-old.